I can't think of two products at further ends of the audio spectrum than a single-ended triode tubed amplifier and a mass-market Home Theater loudspeaker. Single-ended tubed amplifiers are about reproducing subtlety, delicacy, nuance, and communicating the music's inner essence. Conversely, a Home Theater loudspeaker systemparticularly one made by a mass-market manufacturerwould appear to put the emphasis on booming bass and reproducing shotgun blasts, with little regard for musical refinement. What a bizarre marriage it was, then, to pair the new Infinity Composition Prelude P-FR loudspeakers with the Cary Audio Design CAD-300SEI 11W single-ended triode amplifier (reviewed elsewhere in this issue). This combination didn't happen by accident; as you'll see, these apparently disparate products are a match made in heaven. I discovered the Infinity Preludes while surveying Home Theater loudspeaker systems for the upcoming second issue of the Stereophile Guide to Home Theater. In addition to evaluating the loudspeaker systems under review with video soundtracks, I assessed their musical qualitiesor lack thereof. The Preludes were such a musical standout that I rescued them from the Home Theater room (where they had been powered by mass-market receivers and fed with a laserdisc source) and gave them a new lease on life in the larger music room, with reference-quality source and amplification components. The Preludes' extraordinary musical performance and unique design compelled me to tell you about how they performed in an audiophile-quality two-channel playback system. Ed Meitner is one of those rare individuals who charts his own course in audio product design. 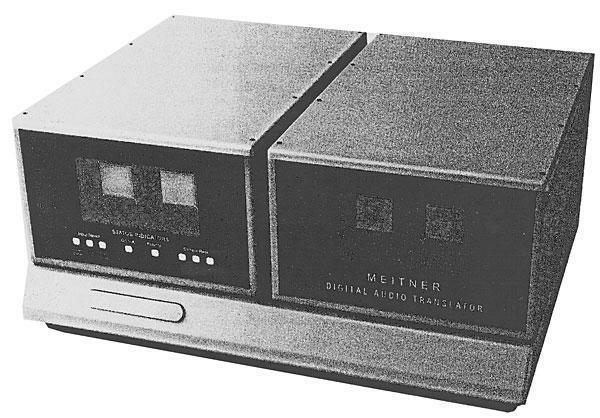 From his platterless turntable of the mid-1980s to his new Intelligent Digital Audio Translator (IDAT, reviewed elsewhere in this issue), Ed Meitner's products have been distinguished by original thinking and innovative engineering. Although not all his designs have been commercially successful, in each he has attempted to advance the state of the art by rethinking fundamental principles. Ed is also pursuing an ambitious project that would radically change the way recordings are made. It began when he recorded an electric guitar through a 10" guitar-amp loudspeaker and was dismayed that it was impossible to even come close to capturing and realistically reproducing this apparently simple sound through another 10" speaker. This experience launched his investigation into why reproduced sound is never mistaken for live music, a quest that may result in a radically new recording technique. The Proceed CD player is the first digital product from Madrigal Audio Laboratories, a company known for their Mark Levinson preamplifiers and power amplifiers, including the very highly regarded No.20.5 power amplifiers. Given Madrigal's track record of producing ultrahigh-end (and expensive) components, I was surprised and encouraged that the Proceed CD player is so affordably priced. The Proceed was a long time in development, reflecting Madrigal's care and thoroughness before releasing a new product. Many technical innovations have been incorporated into the Proceed, and the machine's unusual appearance exemplifies the "start from scratch" attitude behind its development. With its nearly square proportions, grey cabinet, and sparse front-panel controls, the Proceed may set a new trend in audio component styling. The Arcam Delta 170 is one of the first examples of an entirely new product category: CD transports. The concept of different CD transports having different sonic qualities is vexing. It is a simple matter to prove that the bit stream contains identical data from virtually any CD transport (see "Industry Update," Vol.12 No.8). According to Arcam, development of the Delta 170 was spurred by audible differences among transports heard by dealers, customers, and Arcam staff. The possibility that CD transports have their own sonic signatures is intriguing. The VTL 225W DeLuxe monoblocks are very similar to the 300W monoblocks that received such an enthusiastic reception from J. Gordon Holt a year or so ago (in Vol.11 No.10) and, ultimately, most of the audiophile community. Technically, they differ only in output tubes and transformer: the 225W uses EL34s, the 300W uses 6550s. The 225Ws, at $4200/pair, cost $700 less than their more powerful brothers. The question may be raised: Why have two models so close in price and performance? According to David Manley, the 225Ws were built on special order for audiophiles who preferred the sound of EL34s to the 300Ws' 6550s. Demand was so great for the EL34 version that he decided to add it to the line. They look almost identical, the only difference being the smaller output transformer on the 225W and an additional filter capacitor on the 300W's top chassis.